Whether you love dark chocolate, milk chocolate, white chocolate, or any variety of this endorphin releasing, feel good treat, you may be surprised at the amount of positive data there is out there about how consuming chocolate affects the body and how it can have positive effects on your oral health. 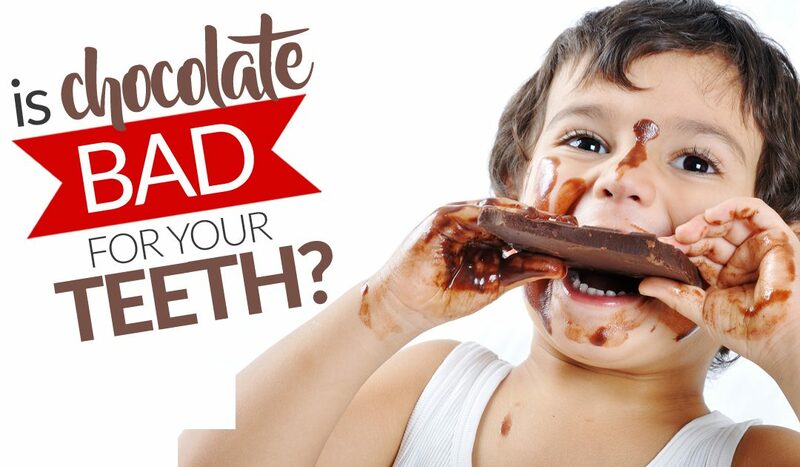 If you are wondering whether chocolate is bad for your teeth, or if consuming too much of it may exacerbate any existing dental conditions that you may have, such as weakened enamel or cavities, then you’ve come to the right place. While there are some negatives associated with inordinate amounts of chocolate consumption, you would be surprised at just how many positives there are when it comes to occasionally eating a moderate amount of chocolate. Just as studies have shown that a glass of red wine daily can improve circulation and overall heart health in normal adults, results released just last year from the Maine-Syracuse Longitudinal Studyhave indicated that eating chocolate on a daily basis over years can actually improve overall brain cognition. The study was conducted observing 968 participants over an 18-year period and the results indicated higher scores on various cognition tests in participants who consumed chocolate on a daily basis. Now if that’s not a great reason to run to your nearest supermarket and stock up, we don’t know what is! All that aside, let’s take a look at some popular types of chocolate and what their effects are on your oral and overall health. Is Milk Chocolate Bad for Your Teeth? Milk chocolate is probably one of the most popular and widely consumed types of chocolate. Unfortunately, it is not so great for your teeth. Why you may be asking? The answer is simple. Milk chocolate contains more sugar than its dark chocolate counterparts and much more than raw and unprocessed chocolate. Milk chocolate is a chocolate made from a combination of cocoa, powdered milk, and sugar. The breakdown is usually 20-30% real cocoa, with the balance consisting of sugar and powdered milk. The higher sugar content that is contained in milk chocolate can cause cavities and tooth decay more so than dark, raw, or organic chocolate. Dark chocolate is by far the better choice when it comes to keeping your teeth healthy and cavity free. There are some studies that even suggest that dark chocolate can be a cavity fighter. Chocolate is made up of over 300 compounds and is a highly complex substance. Dark chocolate contains polyphenols. These chemicals can help fight the overgrowth of bacteria and other organisms in the mouth. They can neutralize organisms that cause bad breath and they can prevent some sugars form turning into acid, which can break down the enamel of your teeth and cause tooth decay and cavities. Dark chocolate contains flavonoids. Flavonoids have been shown to slow tooth decay. Dark chocolate contains antioxidants. Antioxidants are beneficial to overall health in many ways but when it comes to oral health, having higher levels of antioxidants in your saliva has been shown to help fight gum disease. Dark chocolate, otherwise known as “real chocolate”, is made up of around 70% cocoa and only 30% powdered milk and sugar. This drastically reduces the detrimental effect that it could have on tooth enamel when compared to milk chocolate. The numbers are not that different but over time the differences can pay a toll on your teeth, resulting in tooth decay, cavities, and more. Tooth decay occurs when bacteria in the mouth turn sugar into acids. Those acids eat away at surface of your teeth, causing decay and cavities. Tooth decay occurs over time. However, it can be mostly prevented by cutting down on your sugar intake, watching what types of foods you eat, both sweet and savory, and ensuring that you are brushing and flossing your teeth on a daily basis. It also helps to visit your dentist two times per year to identify oral problems early and remove plaque and tartar buildup. For this year’s holidays, go ahead and indulge. Just remember that, as with most things, moderation is the key.